William Dalgliesh IV graduated with a degree in landscape design in Spring 2009. With his educational background along with professional work experience, creative and proficient designs are not hard to come by. We will meet with you and discuss your needs and requirements, then using his expertise he will create an attractive and practical design that meets your budget. For budget management, projects can be broken into phases dependent on the clients needs. 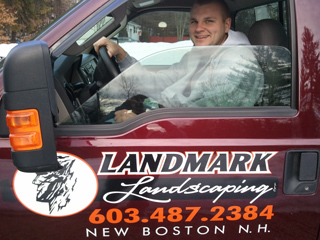 Landmark Landscaping is a family run business and we take pride in our work, quality and customer service is our number one goal.